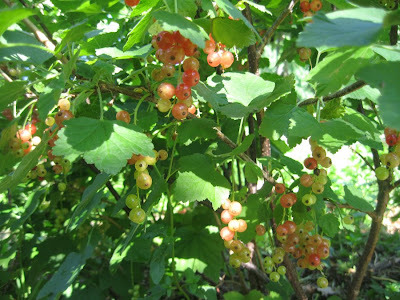 The red currants are not ripe yet. Today we got out into the garden early and enjoyed the simple pleasure of picking ripened black currants. 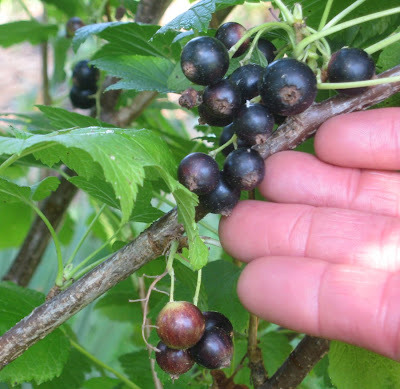 Black currants are a cousin of the more common red currants which are not ripe yet. Some gardeners avoid growing black currants because they have a distinctive strong odor -it is not bad, it is just not good! 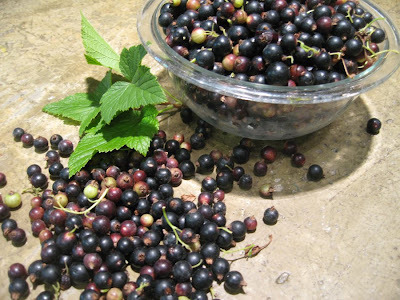 But as soon as the currants are cooked and sugar is added, the rich fruity black currant flavor comes through. Not only are they delicious, the color is beautiful a stunning dark red-purple. The French love to make the juice into sorbet and drinkers of fine liquer know it as Cassis. I love to use them to make black currant jam. What is the best dessert in the world? Well, there is no doubt in my mind that is has to be pie. There is, of course, a pecking order as far as pies go, with fresh fruit pies landing very close to the top of the list. Even above the fresh fruit, the wild, tangy taste of fresh rhubarb takes first place. In earlier years it was even referred to as "pie plant". My mom makes a very good "fancy pie" with a beautiful meringue topping she calls Rhubarb Custard Pie. It involves a bit of effort to make but is worth the effort. 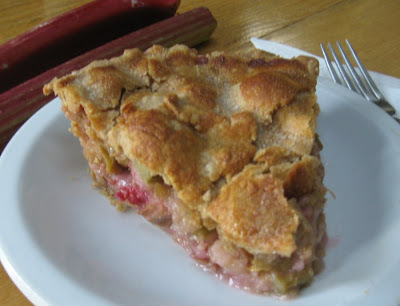 When it comes to real rhubarb flavor, you can't beat a straight rhubarb pie with a touch of lemon zest. This week with the temperature soaring into the 100s, I had to pick my rhubarb before I lost it to the heat. 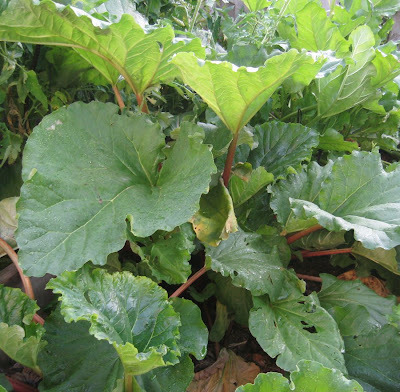 It is not easy to grow rhubarb in Kansas- I have been trying for years. I froze some of it but first made a fresh rhubarb pie and could hardly wait for it to cool down before sneaking a taste....Heaven! Oregano is not only a great herb to use for cooking. I like to dry it just when it breaks into bloom. Because it remains flexible when dry, it is a mainstay for my dried herbs wreaths. 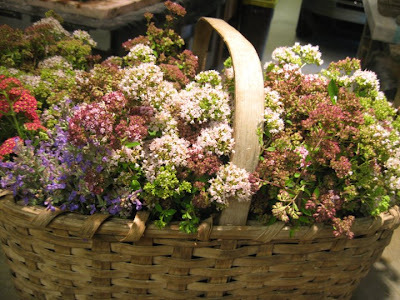 Sarah just finished bunching this morning's cuttings and put them in this basket. Look at the range of colors! Jill's neighbor loved the bottle trellis she bought at From the Summer's Garden. She wanted to give her neighbor a gift that would compliment but not upstage her bottle trellis. We came up with this new bottle tree design using wine bottles. It is a gas! 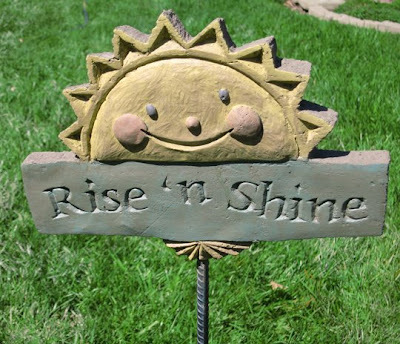 What a great way to turn recycled paper, cement and recycled bottles into cool garden art. 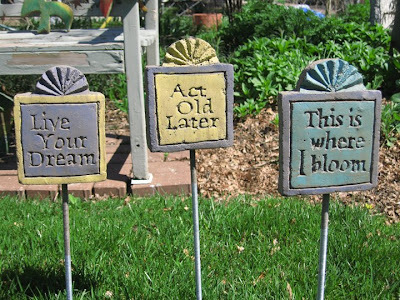 Libbi and Maurice love our Wizard of Oz collection and wanted some of the major character stones as garden stakes. What a great idea! 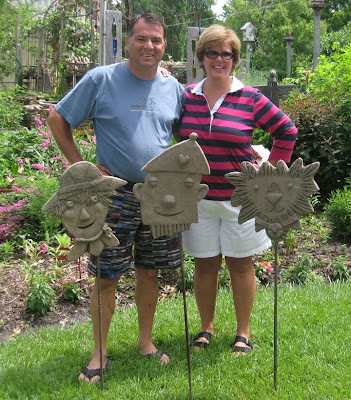 We made a few adjustments to the stone molds and now make these happy characters into stakes as well as stones. 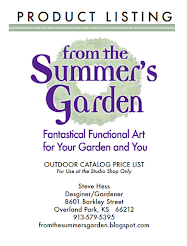 Keep your comments and ideas coming by emailing: summersgarden@everestkc.net. made exclusively by Tom Mulligan, one of our guest artists. 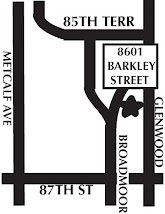 where you want them in the garden. 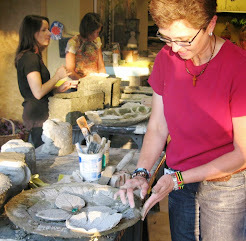 In this HYPERTUFA STUDIO and we had a very creative group making some beautiful things for their gardens. 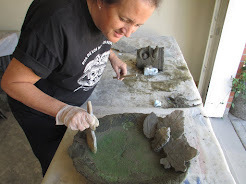 This studio was all "first-timers" who each made 4 different projects to learn the various techniques of making and working with hypertufa and concrete. 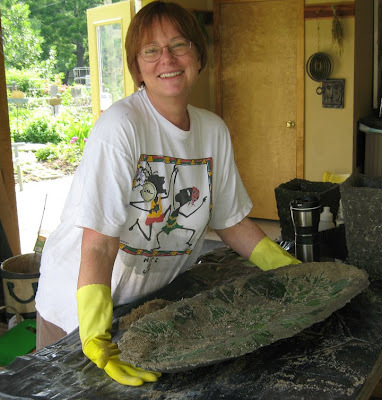 First they made a free-form garden stone. 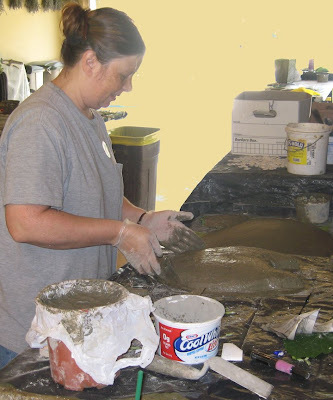 First they got used to working with concrete, then we mixed up a batch of recycled paper hypertufa and made leaf platters, a garden planter and even a sculpted humorous head for garden ornament. 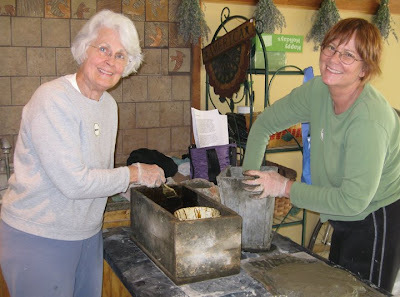 Molds must be oiled well in order for finished planters to be released easily. We recycle used lawn mower oil for this purpose. 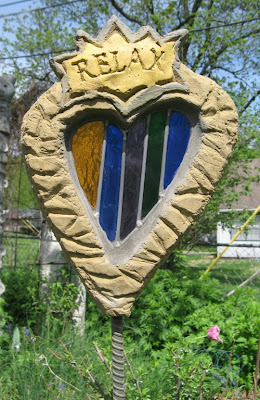 Joanie wanted to make a birdbath in the shape of a heart for her daughter-in-law. 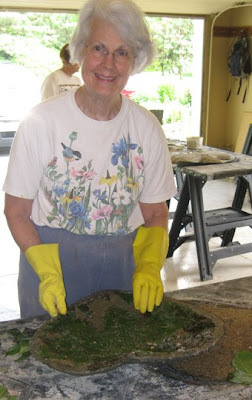 She made a clever diving board for the birds from cast leaves as a side accent to the heart-shaped bowl. Here's Lisa's platter. It will be beautiful in her garden, if she finally puts it out there. She is thinking of using it to serve food at her next picnic. 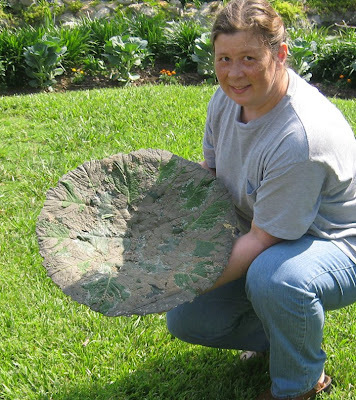 ...and ta-da, here is her finished leaf platter.